July | 2011 | Small Farmers. Big Change. I thought this article in the July 18th issue of the Wall Street Journal about the impact high coffee prices are having on small farmer coffee co-operatives was really important to share. The following is an abridged version of the original article that was posted on the blog June 7th. Usually, I buy Equal Exchange organic, Fair Trade bananas. I work there. I looked for a bunch the other day at my neighborhood coop, but they were out of stock. A month earlier, I might have reached for Dole’s organic bananas. But I’d just returned from northern Peru, where I visited banana co-operatives trying to wrestle out of Dole’s grip. I left the store banana-less but at peace. Thanks to a government agrarian reform program, the Peruvian farmers that I’d visited owned small parcels of land. They had organized themselves into the APOQ and CEPIBO producer co-operatives. With their own land and fruit, their relationship with Dole was different than that of banana plantation workers I’d visited in Costa Rica (more on that in a moment). Dole provided training and technical assistance to the farmers to improve quality for export. The company installed washing stations and packing facilities. The relationship was pretty straightforward and not too bad: the farmers produced and Dole packaged and exported. Things went well for a while – until the farmers had a new idea. They heard about Fair Trade’s higher prices, social premiums, and direct relationships with buyers. There was big demand in Europe. The farmers knew how to produce high quality, organic bananas. Why couldn’t they also handle relationships with international buyers, the washing, packing and exporting? Why not own and manage the entire business themselves? “It wasn’t that we necessarily wanted to compete with Dole; we just wanted to export some of our bananas on our own,” Jorge Domador said. Dole wasn’t so enthusiastic. The company had invested money in infrastructure and didn’t want direct competition from the small farmer organizations. Maintaining the farmers as suppliers was working just fine. Nevertheless, by the late 2000s, both APOQ and CEPIBO had succeeded; they were exporting directly to the European market. Dole responded by cementing the wells they had dug and ripping out their packing stations. How did things go so wrong? Bananas are the most frequently bought grocery item in the United States. They have a huge impact on a grocery store’s volume sales and profits. Retail lore has it that shoppers have the banana’s price etched in their minds and that this one item can influence where someone shops. Many stores are loath to raise the price of bananas. This price ceiling poses a challenge to alternative importers like Equal Exchange, who then need to ask for higher prices from resistant retailers in order to pass along higher payments to growers. On the other hand, Dole, Chiquita and the three other companies that have dominated the global banana export market for over a half century, have the ability to pay high – at least for short periods of time – to squeeze out their smaller competitors. They then turn around and offer low to retailers in the north – thereby eliminating competition on both sides. News about the practices of Dole and Chiquita in Latin America, and elsewhere, isn’t exactly… well, news. In 1954, Chiquita Brands, previously called United Fruit, helped overthrow Jacobo Arbenz, the first democratically elected president in Guatemala because his modest land reform ideas threatened to undermine the U.S-based company’s profits. With CIA backing, the coup d’etat led to a 30-year civil war with over 100,000 dead. Despite lawsuits and scandals about their treatment of workers and support of paramilitaries who have killed unionists organizing workers on their plantations, these companies continue to sell us their bananas. And we continue to buy them. Years ago, I lived on the Atlantic coast of Costa Rica, downstream from a Dole banana plantation. The plantations were endless rows of banana plants, and off in a corner, matchbox housing for the workers. Volumes have been written about the alienation of banana plantation workers, and the drinking, prostitution, and related violence that fills the void. I can’t forget the pervasive smell of the pesticides aerially sprayed over the groves and the fish that washed up dead on the shore of the river where I lived (the same river the community bathed in and drank from). Banana prices can remain unnaturally low when you treat workers and the environment with unnatural callousness. So, in 2006, when Equal Exchange and a few partners decided to build an alternative banana supply chain to buy direct from small farmers, I was elated. Five years later, I was thrilled to visit the APOQ and CEPIBO co-operatives – some of Equal Exchange’s banana farmer partners – and hear how the extra dollar per case of bananas they receive as a fair trade premium had funded youth scholarships, health insurance, and social “safety nets”. They’d also made production and commercial investments like CEPIBO’s cable system. For years, farmers carried 100-pound bunch of bananas long distances to washing stations. Now they simply hook bunches to the cable and the pulley carries it to its destination. This single infrastructure improvement has saved the farmers considerable time and physical injury. Plans are underway to install this system in more communities. These small farmers’ farms average 2.5 acres. But these farms are theirs. Many farmers also grow food to consume – corn and beans and other fruit. Life may not be easy, but it’s integrated and healthy. Sounds like a story with a happy ending? Read on. Supply is down this year. Equal Exchange can’t get enough bananas for our customers. “Whether you choose to believe in climate change or not, it is real and it is affecting us,” said Donald Lecarnaque Castro, President of CEPIBO’s board of directors. In the fall of 2010, when average temperatures should have been in the mid 80s, they dropped to all-time lows. Northern Peru now suffers from an unusual and severe drought. 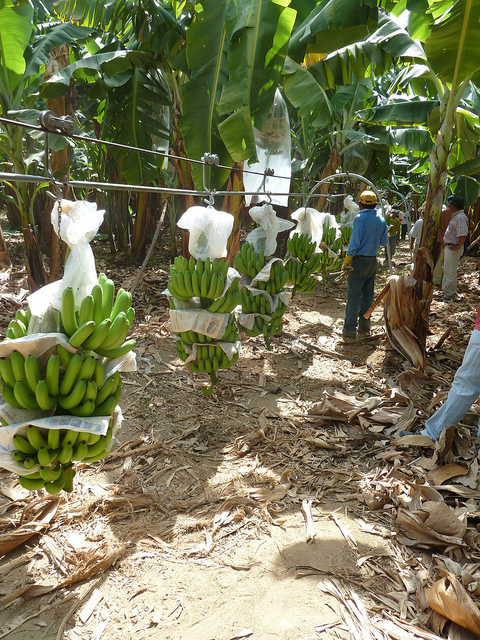 Rains in Colombia, excessive flooding in Guatemala and Honduras, and organic certification issues in Ecuador have also conspired to create fierce competition for a limited supply of organic, Fair Trade bananas. With banana supply low, and demand high, the competition has been brutal. 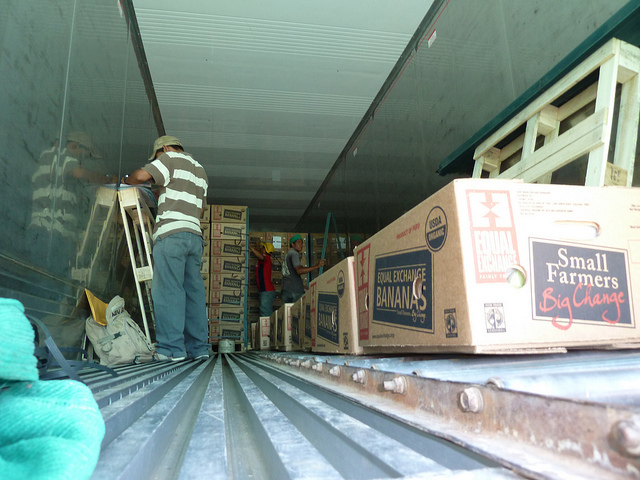 Dole sees it as an opportunity to regain its lost ground in Piura. While the company no longer owns the entire supply chain, it is now attempting to regain control of supply by driving up prices. By offering the farmers a price just higher than what the co-ops they belong to can pay, Dole can break the co-ops. While logic might have it that rising banana prices should benefit small farmers, the price war is pushing co-ops to the brink. The co-operatives are losing some of their members who can’t resist the temptation to sell to the highest bidder. Already, one of CEPIBO’s twelve member associations has left the co-op to sell exclusively to Dole. In general though, José Maria Lecarnaqué Castro, CEPIBO’s General Manager, told us, co-ops are holding on, surviving these predatory strategies. His words were reassuring, but it was obvious that the co-ops are still worried. With good reason. According to Valentín Ruiz Delgado, representative of the Fair Trade Network of Organic Banana Producers of Peru, “These companies take advantage of the fact that we are relatively young organizations and new to the market, confronting very big companies who make use of their economic power.” said Ruiz Delgado. Equal Exchange recently negotiated new contracts with CEPIBO and APOQ, including higher prices to help them compete. But Dole raised its prices twice more. We are now paying considerably more (over conventional prices) per case of organic, Fair Trade bananas. In the meantime on the grocery shelf, the price remains steadfast at $.99 a pound. But it’s not just the banana producers getting yanked around. Here in the U.S., the big 5 offer lower prices to retailers. Whatever the going price is for a pound of bananas, these companies offer theirs for a little bit less. Small farmer co-ops like CEPIBO and Fair Trade wholesalers like Equal Exchange find themselves in similar positions: how do businesses motivated by a social mission survive against a handful of multinationals that control the entire industry? In the end, retailers and consumers will have to decide how much they value small farmers, co-operative organizations, independent suppliers, and their social mission. Are we willing to pay a higher price – one that reflects the true cost of a bunch of bananas – for those values? I hope that one day, Fair Trade bananas grown by small farmers become a mainstream idea, and a household staple. Like CEPIBO and APOQ, we can tell Dole “no business-as-usual”. Their unfair practices serve up bruised bananas – too sad and tasteless to be acceptable. Back in May, Tom Hanlon-Wilde wrote a post about a trip to Peru he was taking with the General Managers of West Coast natural foods stores to visit a community they had first gone to visit ten years ago. Since that time, Tom and the store managers have kept up a strong relationship with these coffee farmers who are all members of COCLA, one of Equal Exchange’s longest trading partners in Peru. During the ten years that have passed between trips, several of the farmers have come to the U.S. to visit the General Managers, tour their stores, and learn about this side of the coffee market: a true exchange! Click here to see a video that was made about this trip. An Equal Exchange Sales Representative humorously describes what it’s like trying to sell coffee in a buy-local market. Click here. I was hoping to initiate a discussion, a reflection on what is happening with coffee—and not just with coffee; but with fair trade in general. Coffee has been and continues to be the leading fair trade product and whatever happens with coffee will, in one way or another, mark the future of fair trade. And we are very concerned about what is happening currently. You all know that in the 1990s, around the world and especially in Peru, a process was undertaken to reactivate co-operatives and producer organizations. Fair trade provided us with an advantage; allowed us to be more competitive and this in turn enabled us to develop our organizations. We have seen significant coffee sales and we have been able to diversify. We have diversified with regards to the financial market and with regards to the local market. For some time now we have entered a third phase of fair trade. The first phase of fair trade was motivated by the solidarity of consumers that purchased coffee because of their social commitment. Sometimes the product was not high quality, but these consumers continued to buy as a result of their social commitment. That was the first phase of fair trade. Then we moved into the second phase, which required another level of professionalism. This was an important step forward in which fair trade products became synonymous with quality—superior to the coffee offered by the conventional market. That is when fair trade became a reality. But now, FLO’s [The Fair Trade Labeling Organization’s] incentives and promotion is creating a vision which only considers the importance of gaining market share. The hypothesis is that if we lower prices, and if we lower the standards, we can gain a greater share of the market. Initiatives such as FLO have established a methodology. For example, we have to multiply the number of producers by five and we have to increase volume in five or ten years. We have to gain a greater share of the market. I think that this optimism and this vision that is limited to gaining additional market shares have brought us into a new phase and we think that this phase presents a serious threat to our organizations. On the consumer end, transnational companies are now included in fair trade. And for us as well, there are also large companies participating. We will probably not be able to compete with these companies so I think that now is the time to define the path. What is the path? What is the future of fair trade? If fair trade continues to follow a vision exclusively tied to growth and sales and the marketplace, we believe that this is the wrong way to go. The impact and advances that have been achieved are at stake. I believe that extraordinary achievements have been made in Peru. We think that fair trade should return to its origins and that the focal point or primary orientation of fair trade should continue to be the organizations; the small producers. Unfortunately, these decisions are not currently being made in the best interest of the producers; they are taking into account the interests of large companies. We propose a return to our origins and suggest that the producer organizations should be the focal point. We also think that fair trade in and of itself is not the end goal. We believe that in addition to operating companies that buy and sell in a professional and efficient manner and compete in the international market, we should also act as organizations. Examples [of these producer organizations] include Cepicafe, Cocla, and Escobaza . We have become protagonists and politicians; we play an important role in the economy; and we believe that fair trade should use its influence to impact regional decisions made by other institutions, by international aid, and by local, regional and national government. I think that this is the role that we play currently and that this is what fair trade should be supporting. 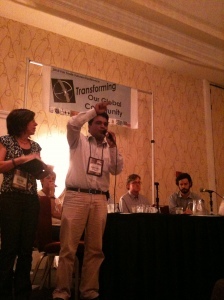 In September 2010, Santiago Paz, co-director of CEPICAFE, a small farmer co-operative in northern Peru, stood up at the Fair Trade Futures Conference in Boston and uttered “the shot heard around the fair trade world.” As a speaker on a panel discussing the future of fair trade, Santiago’s words caused a stir throughout the packed conference when he likened the fair trade certifiers (FLO and TransFair USA) to the drivers of a car speeding down the highway. The vehicle careens faster and faster toward its destination; the drivers oblivious to the fact that the small farmer passengers have all gone flying through the windshield. He concluded his remarks claiming that if left unchecked, the fair trade certifiers will end up causing the “extinction” of small farmers… the very people the system was originally designed to support.